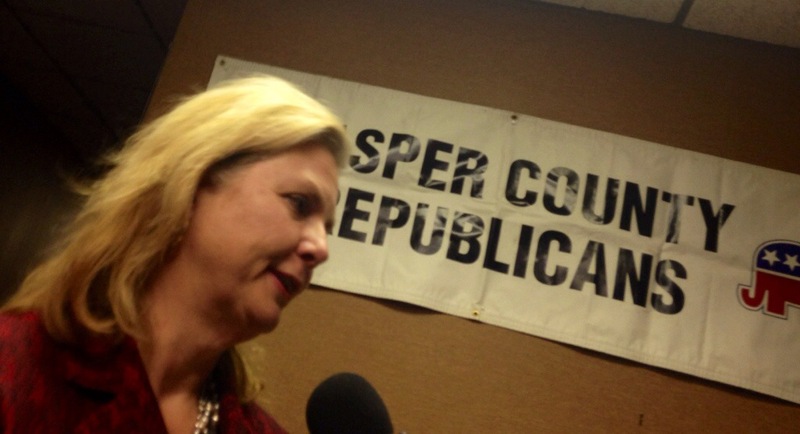 JOPLIN, Mo.– 2014 voters yet to cast their votes, but as Missouri Republicans kick off this year’s Lincoln Day circuit – the focus is increasingly on the 2016 Republican primary. While state Republican House and Senate committees ready to defend their hold on the General Assembly, here in Joplin, a blend of 2016 hopefuls – including former House Speaker Catherine Hanaway, Senate Appropriations Chairman Kurt Schaefer, House Speaker Tim Jones, and Auditor Tom Schweich – spoke and made their implicit cases to voters in this primary battleground. Hanaway, who is mulling a gubernatorial bid, was all but subtle in her remarks to voters – taking direct aim at Democratic gubernatorial hopeful Chris Koster and the office’s current occupant, Gov. Jay Nixon. In an interview, Hanaway said she is getting a lot of encouragement to run for governor. “(Chris Koster’s) policies are far too liberal for Missouri. We already have terribly slow job growth in Missouri. I don’t see anything he would do to increase the number of MIssourians who would find jobs and that is the most important thing,” she said. Hanaway’s campaign operation is already beginning to form. She has begun work with Jeff Roe’s Axiom Strategies out of Kansas City. Over the summer, her apparatus began an aggressive research operation into potential rivals. And last week, she hired a campaign aid to help her navigate the state. 2016 is here in Missouri – three years early. Schweich, a likely primary foe for Hanaway, was more subtle in his positioning Saturday night. Schweich, the only statewide Republican whose name is on the ballot this year, has said Republicans should not forget about the 2014 election, where Koster and other Democrats have pledged to target the Republican’s grip on the General Assembly. “We had to focus like a laser on protecting our legislative veto proof majorities,” he said. In a nod to agriculture groups, Schweich noted his support of this year’s “right-to-farm” ballot measure. Schweich also claimed, “no one is more pro-gun than I am,” in a less-than-subtle jab at Hanaway over her early opposition to conceal carry in Missouri (which she ultimately supported). Jones, in Joplin in his capacity as Speaker of the House, spoke in broad tones about the legislative session and the year ahead for electing House Republicans. He may be backing away from his early indication that he was considering a bid for Attorney General, instead focusing on another down-ballot race. The traveling road show of sorts will begin to pick up this month, as several counties have similar gatherings planned. The entire state party will gather on February 21 for the Missouri Republican Assembly’s statewide Lincoln Days in Springfield, with featured speaker Sen. Rand Paul, R-Kentucky.